Children will explore a virtual and interactive world filled with lovable and engaging characters. No two lessons are exactly the same, allowing them to have varying and interesting experiences that will pique their curiosity and drive their desire to learn. Children will learn through spaced repetition, gradual immersion, and meaningful interactions. When playing our apps, children are not just passively listening to language, but they are actively making choices and interacting with a beautiful and rich virtual world. Children will enjoy the process of learning any language while doing what kids do best: playing! Our apps have been designed to delight and entertain kids with an interesting narrative, lovable characters, and interactive games that will motivate children to keep playing and learning. 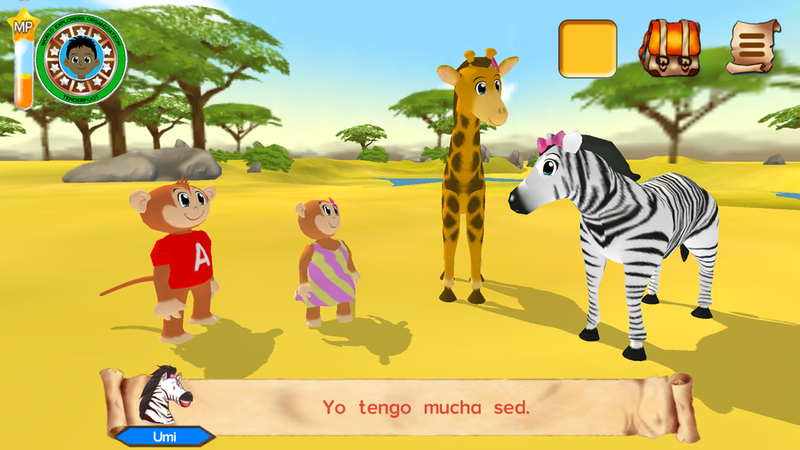 Spanish Safari is a language learning application for children 5 to 9 years old, but is also appropriate for younger children with the assistance of their parents. This fun and interactive program is designed to take children from beginner Spanish to intermediate level in less than 30 hours of game play. Spanish speaking children from around the world will able to help the animals solve the mystery of the missing water; while learning English! The app is available for iOS devices (Android coming soon!) and is expertly designed for children 5-9 years of age. Learn Safari is proud to announce our most ambitious project yet: English Safari for Mandarin Speakers! Working with talented educators from around the world, we will be creating a unique version of English Safari to help the millions of Mandarin speaking children who are actively learning English. Join our monthly newsletter below to stay up to date on this exciting endeavor. Reading Safari is the revolutionary new game being developed by the Learn Safari team. The game will incorporate the loveable characters of our popular language learning apps and focus on key curricula of literacy standards in English. Reading Safari is designed to be the most intuitive resource for Children who are learning to read. Coming soon for iOS and Android devices!